I love the holidays for a number of reasons. Fashion, holiday entertaining, festive decor, holiday music, are all reasons why I absolutely love this time of year. If you didn’t guess already, the number one reason why I love the holidays is the clothing. Holiday fashion is spectacular. I love the glitz and glam of holiday fashion. Dressing up and looking glam for festive parties are a true highlight for me, all fashionistas. In addition to attending events, I also love hosting. That is why I partnered with Lemiga events to create tips on how to nail your holiday style. My tips on what to wear while entertaining for the holidays are featured in Lemiga’s “Fashion, Food and fabulous table entertaining tips for the holidays” article. Lemiga events is the brain child of event planner and designer Michelle Gainey. She is an exceptional event designer, and has created amazing events for Atlanta’s elite as well as international celebrities such as Cardi B. The article highlights easy tips to entertaining the right way during the holidays. Tips on Fashion, Food and table settings are all highlighted in this article created by industry experts. (Read full post here). 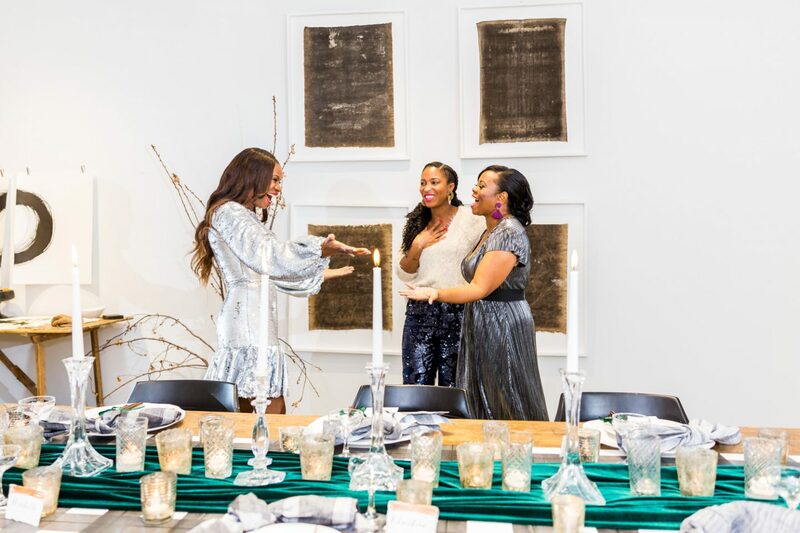 Being deemed the perfect host does not end with serving great food, and amazing holiday decor. You have to look the part. Wearing the right outfit while hosting guest is key to entertaining the right way. In order to be “The Hostess With The Mostess”, your outfit has to feature one of my three must-have holiday fashion trends. As far as I am concerned sequins is synonymous with holiday entertaining. 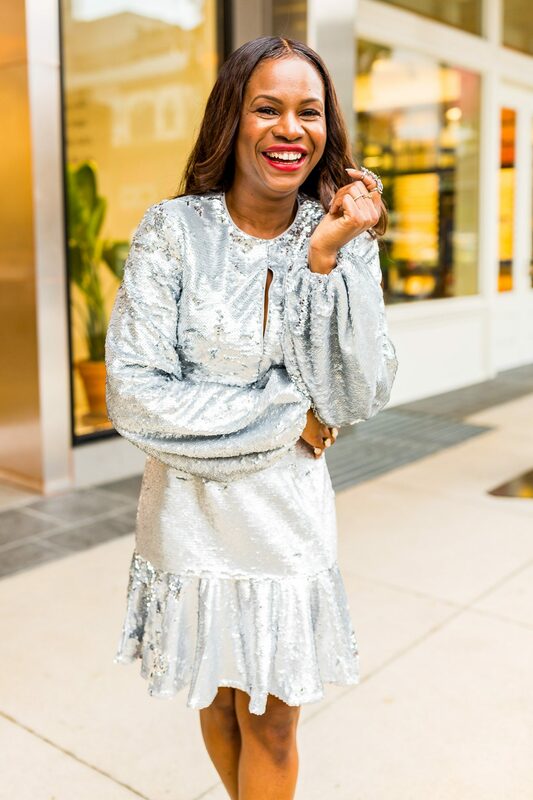 You cannot attend a holiday event without sequins making a debut. The sparkle and glam from sequins compliments any holiday decor, hence it is the perfect style choice. Metallics always make a statement. 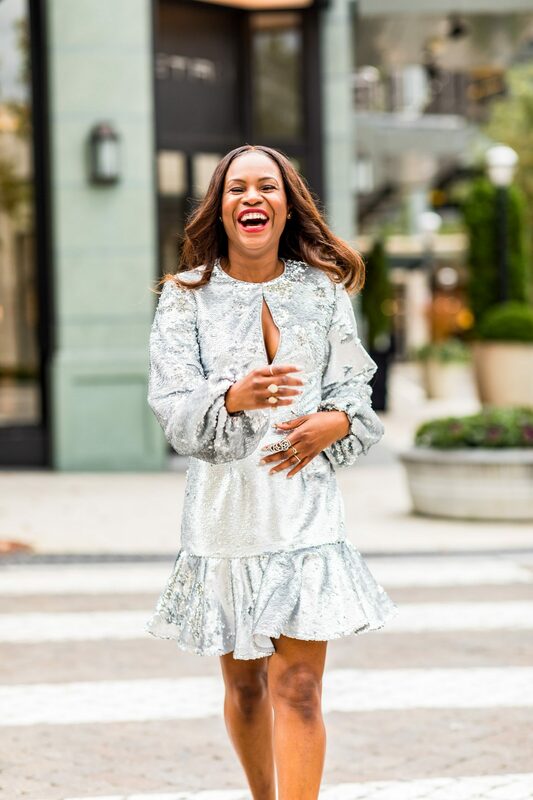 Whether you are wearing metallic shoes, a metallic dress, a skirt, or even a subtle metallic pair of pants, they always make the right statement during the holidays. You’ll be surprise how versatile metallics are. They have the ability to blend into any festive occasion, and do an excellent job of complimenting most fabrics and colors. Rumor has it that metallics are on the verge of replacing sparkle details like sequence this year, but the verdict is not yet in on that. There is one fabric that is as versatile as the holiday events you will be attending, and that will be velvet. Whether it’s a family gathering, a holiday office party, or drinks with friends, velvet is that one fabric that you can wear to all events. This rich, luxurious fabric is a winner, and makes a statement every time it is worn.